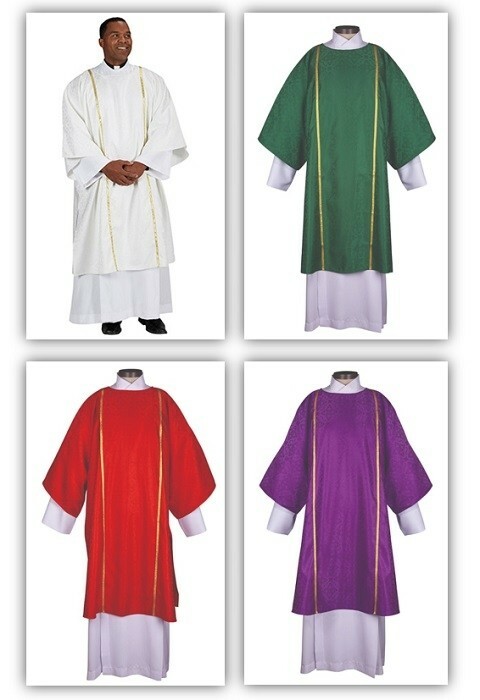 R.J. Toomey Classic Jacquard Collection set of four dalmatics (green, white, purple, red) with classic round neck and inner stoles have gold lace trim on front and back of vestment, and are tailored with Velcro side closures for a non-slip fit. Jacquard polyester fabric resists wrinkling, keeps you comfortable and is tailored for a beautiful drape. Compare to any other vestment brand - you won't find a better value on everyday dalmatics! Save when you buy the set!